On the day that Mitch is released from prison after serving three years for a crime he doesn’t remember committing, Billy Norton picks him up with a bottle of whiskey and puts him up in a plush London flat. All Mitch wants to do is keep an eye on his mentally disturbed sister, and try and go straight. Norton though has other ideas, throwing a release party that half the South London underworld attends. They want Mitch to help Norton run their loan books, turning over anyone who won’t or can’t pay. Mitch wants to stay away, managing to get a job as the handyman to a once-famous, reclusive aging actress, Lillian Palmer, who dreams of making a stage comeback, but the death of Joe – a homeless, Big Issue seller – and the tug of the underworld, means that escape is futile. Instead, Mitch is drawn into a deadly game that he knows is unlikely to have a happy ending. Ken Bruen seems to write effortlessly with a strong first person voice – the prose flows with great cadence; it’s as if it’s he’s sitting in a pub with you recounting the story over a few drunken pints. In London Boulevard he manages to convey a scene and the essential essence of characters in a few words, enabling the story to fly along. It almost feels like a movie script, which is where I think the book underplays things a little. 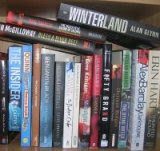 I found myself wanting to slow things down a little in places and find out more about the back story and relationships between characters or to find out more about a particular bit of the storyline. The plot where it concerns Mitch’s re-absorption into the South London underworld and his relationship with his sister is very good, though the plotline concerning his attempt to go straight by working as a handyman doesn’t work quite so well given its plot device nature, but it does bring things to a typical Bruen noir ending. There’s also a nice use of intertextuality throughout. 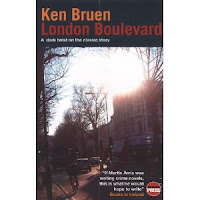 Overall, Bruen’s voice and writing win out to provide an entertaining slice of London noir. P.S. I’ve just noticed that the book has recently been made into a movie of the same name – released in November 2010. Having watched the trailer - it's clear that the movie makers have rehashed the entire thing and it's hopelessly miscast with respect to the book. Why they have done this is beyond me, the book would have made a decent movie without being entirely re-written and populated with other characters.